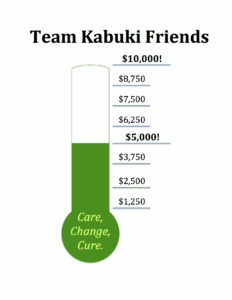 Team Kabuki is just over half way towards reaching our fundraising goal for the Roya Kabuki Program! As the event is approaching this weekend (Sunday, June 10) we are getting excited to walk with some local families, raise awareness, and celebrate the Kabuki Syndrome community. More details for the walk can be found here. There is still time to register, or support our fundraising efforts. Thank you to all who have already donated! Pre-walk activities begin at 9:00AM (crafts, magicians, etc.) at the Hatch Shell. Participation numbers and T-shirts can be picked up at the T-Shirt Pickup Tent if you did not previously receive yours in the mail. Our team will be meeting at 9:45AM at the Team Photo Area to get a picture and start the walk! After the walk, we will plan to meet up to the left of the Hatch Shell and enjoy some post walk BBQ and activities. Please contact Tara at kabuki@childrens.harvard.edu or 857-218-5254 if you have any questions before walk day. See you there!